Fancy charging up your MacBook by simply having it out in the sun? A new solar panel accessory for Apple's latest MacBook promises to let you do just that. 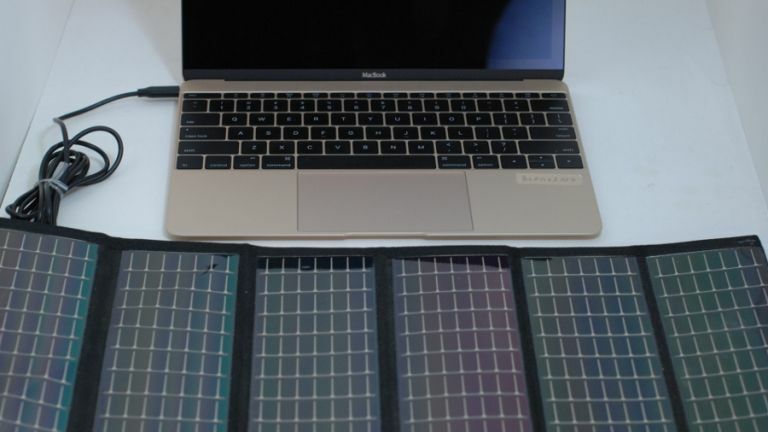 The panel, which is made by QuickerTek over in the US, goes by the name '30 Watt 2015 Type-C MacBook Solar Panel'. As that moniker suggests, it hooks up to the new 12-inch MacBook via its USB Type-C port. The foldable solar panel is a lightweight accessory, and once hooked up to the Apple laptop powers the notebook for use and charges the battery up at the same time. That means you can charge your MacBook up anywhere – providing it's sunny, of course – and also save a bit on your electricity bill. As for the speed of charging facilitated, the maker claims that the peripheral will juice up the notebook as fast as being connected to a power socket with the official 29W Apple charger. When folded up, the solar panel's dimensions are 280mm x 165mm, and when spread out it's obviously a fair bit larger at 762mm x 805mm. The whole thing weighs in at 1.3lb (just under 600g). The 30 Watt Solar Panel is on sale in the States now priced at $399 (around £255). QuickerTek also makes an external battery pack which hooks up to the 2015 MacBook via the USB Type-C port. This adds eight hours to the MacBook's longevity when you're out and about, and can be recharged simply by using Apple's OEM charger. This accessory is priced at $299 (around £190).